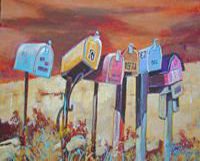 Margie Whittington is a Fort Worth artist who paints primarily in watercolor. She also does acrylics and oils and is an accomplished calligrapher. Margie attended the University of Texas at Arlington where she studied commercial art. Margie is both a professional artist and teacher - having taught watercolor at the Upstairs Gallery for over 15 years Margie's art association memberships include signature member of the Southwestern Watercolor Society in Dallas, Texas and signature member of the Society of Watercolor Artists in Fort Worth, Texas. 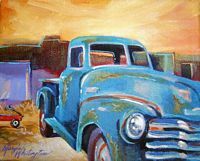 Her work has been featured in the Preservation Is The Art Of The City ArtShow And Sale benefiting Historic Fort Worth, Inc. She has also been featured in a multitude of juried shows and has had the privilege of winning several awards. Margie has studied with many professional water media artists such as Al Brouillette, Judi Betts, Doug Walton, Maureen Brouillette, Tom Lynch and oil painter, Jean Chambers, just to name a few. Margie is currently a member of an art group known as Canvas by Canvas. This is a group of 11 artists who paint interesting and colorful subjects together. Each of their finished paintings is the result of the combined efforts of a majority of the members of the group.